The Irish Hill Neighborhood Association invites urban designers, architects, landscape architects, and artists to envision the future of a 30-acre post-industrial site in Louisville, Kentucky. 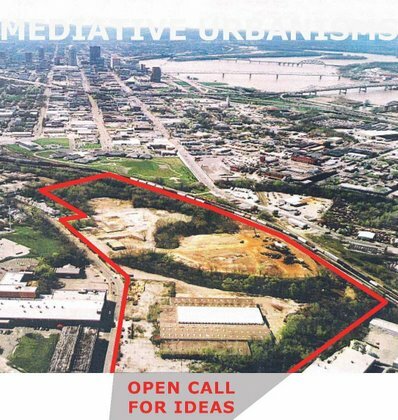 Mediative Urbanisms is an international open ideas competition created to encourage critical design approaches and public debate around a potentially vital zone in the landscape of Louisville. Development processes often evolve and proceed with little direct feedback or interest within the public realm, immediate or otherwise. The IHNA seeks to foster a continued discussion of this site’s potential by inviting the input of designers world wide to help drive the process through a public display and evaluation of concepts. The project site, located just east of the city center, is bisected by the lower middle fork of Beargrass Creek near its convergence with the South Fork. Historically inhabited by distilleries and most recently by River Metals (a scrap metal and recycling yard), the site is currently both a brownfield in need of rehab as well as a potential ecological jewel in the urban landscape of the city. The site poses further challenges as an urban design problem due to its unique configuration, adjacencies to various neighborhoods and present boundary conditions. This image represents the entire Irish Hill Neighborhood. The project focuses on an area in the northwestern portion of the neighborhood. Because this is an open ideas competition, each entry will be expected to interpret programmatic need within the given urban context. This allows participants great freedom in applying their unique vision to the project. With this freedom comes the additional responsibility of imagining the site’s potential role in the daily life of the city. Of particular concern in this competition/exhibition is to provide an expanded idea of the site’s possibilities for public consideration. At minimum, each entry should include specific attention to three program elements. First, entries will examine the potential for the Lexington Road corridor to become a mixed-use zone accommodating pedestrian and bicycle traffic. Second, entries will provide a bus hub capable of accommodating the confluence of three separate routes with adequate waiting areas for riders. Third, entries will provide ample pedestrian/bicycle access between the north and south edges of the site. The site is bordered to the north by an operating railway, which currently isolates the area from the Butchertown and Downtown neighborhoods, minimizing its commercial potential. City residents would like the area to be developed into a long-lasting, pedestrian friendly zone that connects the adjoining neighborhoods with daily-use programs linked to the communal and ecological health of the city. As indicated in a survey of area residents, the most desired program is a neighborhood market, due to the lack of grocery stores and produce markets in the immediate area. The survey further indicates support for programs including light industrial shops, medical clinics, small-scale educational facilities, park space, high-rise residential construction, patio-style dwellings, small-scale commercial spaces, greenhouses for food production and a farmer’s market. Participants are encouraged to couple innovative strategies for ecologically-driven design with and urban strategy that fuses the currently isolated site into the larger urban context while preserving adjacent residential properties. The competition is open to all individuals or design teams of any make-up who would like to contribute ideas to this public exhibition. A $70.00 registration fee is required for entry and will apply entirely toward printing, mounting, and administration costs. The entry fee can be paid by credit card at by clicking this link (registration closed; link removed). Upon registration, design teams and individuals will have password protected access to an ftp site containing site maps, photos, background information, and a dwg file of the project site. Final submissions will be sent via email to irishhill@techemail.com in pdf form by October 5, 2009. Each entry will include (2) two 24”x36” boards in landscape orientation. Proposals should include at minimum a plan concept defining new construction, information regarding on-site circulation and the connections between the site and adjacent areas, as well as the intended programmatic content. Inclusion of any perspectival imagery or other data necessary to elucidate the architectural concepts of the work is encouraged and is left to the discretion of the participants. Presentation boards may include any texts necessary to the communication of the respective project. In addition to the two boards, a supporting text of 300 words or less (letter size pdf or word document format) will be included to clarify the ideas at work in each respective project. This supplemental text will be made available to the jury members during the evaluation of the projects. All entries must remain anonymous for the purposes of the juried exhibition. Projects will be identified by a project number that will be assigned to each participant upon registration. This number is to be prominently located on the front of each submitted board. Provided by contestants in a separate pdf or word document, each entry must include the names and contact information for all members of the design team. This information will be attached to the back of the exhibition boards so as to identify the winners upon announcement of the competition winners. Winning entries will be contacted via email. The public exhibition and jury will be held on October 15, 2009 in The Green Building (http://www.thegreenbuilding.net), a new multi-use facility in Louisville’s emerging arts district. This exciting new venue will provide a beautiful context for the display of work and links the proposals with new approaches to building that are currently gaining momentum in our city. Submitted projects remain the intellectual property of the respective designers. The IHNA cannot return the hard copy presentation boards printed for purposes of the exhibition. The IHNA is not liable for lost, misdirected, or late entries, as well as any entry that identifies the designer to the jury. The decision of the jurors will represent their respective professional points of view, not those of the IHNA or other local entities. All prizes will be awarded at the discretion of the jury and the decision will be fi nal. Winners may be asked to supply individual project images and/or biographical data for inclusion in local media articles covering the event or other subsequent publications. The IHNA has no intention to award or grant any building contracts for the winning submissions. Submissions will be available for public viewing during the October 15 event and will not be made available to any developer, architect, or other entity without consultation of the respective designer/design team. KYTC is planning to paint stripe Bardstown Rd. this weekend between the intersections with Taylorsville Rd. and Lexington Rd. The time for the painting will be between 10:00 PM on Sunday 7-26 and 5:00 AM on Monday 7-27. The Irish Hill Neighborhood Association would like to thank those who attended our meeting last Wednesday. Fortunately, those folks present were able to hear and have questions answered about the exciting new International design competition that IHNA is hosting. However, due to a scheduling conflict with Gilda’s Club, the large media meeting room was unavailable for the Center For Neighborhoods‘ presentation. IHNA is rescheduling this presentation at our next Board of Directors meeting on Monday, August 3rd at 6:30 PM. The Board meeting is held at Gilda’s Club and is open to the neighbors and the public. IHNA apologizes for any inconvenience. The Irish Hill Neighborhood Association is happy to announce Barbara Sinai, Architect, as another member of the Jury Panel for the recently announced Mediative Urbanisms design competition. Registration for Mediative Urbanisms continues by clicking here.